where r is the radius and h is the height. The first one is used for shell method around y axis, and the second one is shell method around x axis. Shell method can even be used for rotations around specific x and y values. 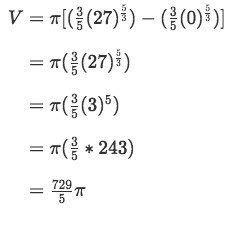 Ignoring the constant of integration, we see πr2 h is the cylinder volume formula. Now here is a question you are probably asking. Why do we introduce another method? This is because there some cases where the disc method (or washer method) actually fails, and cannot calculate the volume of a solid. Let me give you an example. Question 1: Find the volume of the solid obtained by rotating the region bounded by the x-axis and the following curve about the y-axis. Where outer is the outer radius of the circle, and inner is the inner radius of the circle. Obviously the volume is not 0, so the washer method fails here. Now let&apos;s actually do the question with shell method. Now what were going to do is rotate this around the y-axis, and show you how to imagine the cylindrical shell. So this is how shell method integration looks like around the y-axis, but what around the x-axis? Let&apos;s do a question with that. 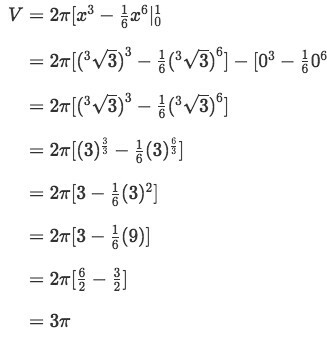 So the upper bound is 3. Now what is the radius and height? We need to look at what the graph looks like when it is rotated around the x axis. Now we have everything to plug into the formula. which is the volume of the solid. As you can see, we get the same answer. Hence, both shell and disk method works here. 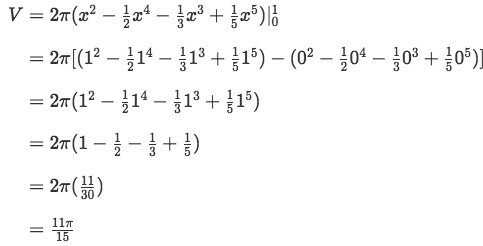 Let&apos;s take a look at a question which involves rotation around a specific x value. First of all, let&apos;s draw the curves and see where the region is. 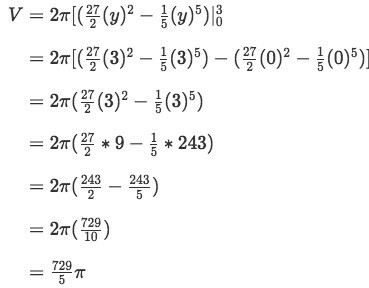 However notice that we are only dealing with positive regions, so we are going to exclude x=-1. 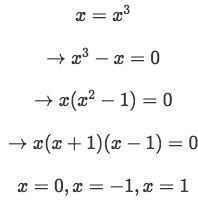 Hence, the two x values are x=0, and x=1. Now we are going to rotate this graph around x=2. If you didn&apos;t understand why the radius and height are those equations, then you might be able to see it in the next graph. which is the volume of the solid. Keep in mind that this is also solvable with washer&apos;s method. 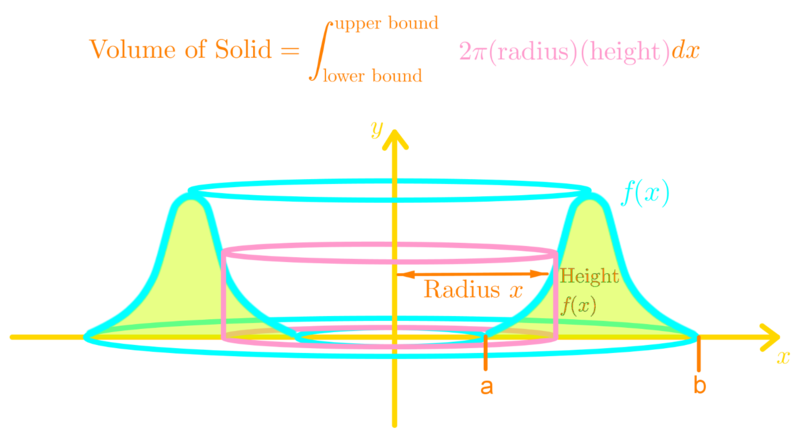 If you want to look at more examples of finding the volume of solid using the shell method, then I suggest you look at this link.